The Holy Spirit is a person and God at the same time. Jesus said in John 14:15-16 AMP that if we would obey him, he would send the Holy Spirit to us as his personal representative while we are still on this earth (after we commit our lives to Jesus and before we leave this earth). In John 14:10 AMP and John 14:24 AMP Jesus says he (Jesus) is in the Father so the words he (Jesus) speaks are not just his (Jesus') own words but the Father's words also. Then Jesus explains in John 14:26 AMP that the Father will now send the Holy Spirit in the name of Jesus, and the Holy Spirit will teach you all things. The Holy Spirit will not make up false things. The Holy Spirit will faithfully represent Jesus to us on earth. The Holy Spirit will help you remember things just when you need them. Our emotions and things we have previously decided are true may cloud our hearing and understanding. We can still tune into the Holy Spirit's teaching and benefit from his knowledge, his wisdom, his peace and his love. We can choose to believe the Holy Spirit rather than our own thinking and experiences. In Ephesians 1:13-14 AMP Paul the apostle says the Holy Spirit being an intimate part of our lives now is the down payment on and guarantee of our going to be with Jesus forever in heaven. A guarantee from God is an excellent thing! So I ask you, is Jesus coming again for you? This depends on your choice to know him now and to receive all that he has for you now, on earth, in this life. Jesus made this wonderful promise; (John 14:2-4 AMP) 2"In My Father's house there are many dwelling places (homes). If it were not so, I would have told you; for I am going away to prepare a place for you. 3And when (if) I go and make ready a place for you, I will come back again and will take you to Myself, that where I am you may be also. 4And [to the place] where I am going, you know the way." So Jesus is coming again for those who know him! It won't be the case of Jesus knocking on your door and you open it and he says he has come to take you to himself and you say, "Who are you???" You will have invited Him into your life, you will have obeyed Him, and you will have told Him things you would never tell another. He won't have to knock, you'll just look up from what you're doing and you will see him looking at you and you will know it's time, and in a moment, you'll be gone. In fact, Methuselah took care of Enoch's affairs longer than Enoch lived! Another way to leave earth (it happened one time that we know about) was in II Kings 2:1 AMP. "1When the Lord was about to take Elijah up to heaven by a whirlwind, Elijah and Elisha were going from Gilgal." So God was sending a taxi for Elijah in the form of a whirlwind. 11"As they still went on and talked, behold, a chariot of fire and horses of fire parted the two of them, and Elijah went up by a whirlwind into heaven. 12And Elisha saw it and he cried, My father, my father! The chariot of Israel and its horsemen! And he saw him no more." Elisha spent virtually all of his time with Elijah. Although he was sad to see Elijah go, Elisha got his desire which he expressed to Elijah just before it happened. 9"And when they had gone over, Elijah said to Elisha, Ask what I shall do for you before I am taken from you. And Elisha said, I pray you, let a double portion of your spirit be upon me." 13"He took up also the mantle of Elijah that fell from him and went back and stood by the bank of the Jordan. 14And he took the mantle that fell from Elijah and struck the waters and said, Where is the Lord, the God of Elijah? And when he had struck the waters, they parted this way and that, and Elisha went over." How sad was Elisha? Not too sad in the end, for he now walked with the God of Elijah in a double portion. God knows how to take away all but natural grief! Another way to leave earth is by simply reaching the end of your natural life as Lazarus did. If you are in Christ, the angels will come for you. Luke 16:19-31 AMP expresses this so, 22"And it occurred that the man [reduced to] begging died and was carried by the angels to Abraham's bosom." Jesus told this story and he would be the one who would know about such things. If angels who completely obedient to God and are already ministering to those who know Jesus personally now on this earth (Hebrews 1:14 AMP) are coming for you and me, I think we're going to be just as safe as Enoch and Elijah. In the case of Stephen, killed for his faith, here is his testimony in Acts 7:55-56 AMP, Acts 7:59-60 55"But he, full of the Holy Spirit and controlled by Him, gazed into heaven and saw the glory (the splendor and majesty) of God, and Jesus standing at God's right hand; 56And he said, Look! I see the heavens opened, and the Son of man standing at God's right hand!"... "59And while they were stoning Stephen, he prayed, Lord Jesus, receive and accept and welcome my spirit! 60And falling on his knees, he cried out loudly, Lord, fix not this sin upon them [lay it not to their charge]! And when he had said this, he fell asleep [in death]." Stephen had the presence of mind to pray for his killers even while he saw the glory of God and Jesus standing at God's right hand. What a way to go if you have to go that way! A different Lazarus did reach the end of his natural life in the story in John 11:1-44 AMP. Lazarus had been lying in a tomb for 4 days. In John 11:25-26 AMP Jesus said, 25"I am [Myself] the Resurrection and the Life. Whoever believes in (adheres to, trusts in, and relies on) Me, although he may die, yet he shall live; 26And whoever continues to live and believes in (has faith in, cleaves to, and relies on) Me shall never [actually] die at all." To prove this, Jesus took a man who was decomposing (beyond any trick) and spoke life into him. 40"Jesus said to her, Did I not tell you and promise you that if you would believe and rely on Me, you would see the glory of God? 41So they took away the stone. And Jesus lifted up His eyes and said, Father, I thank You that You have heard Me. 42Yes, I know You always hear and listen to Me, but I have said this on account of and for the benefit of the people standing around, so that they may believe that You did send Me [that You have made Me Your Messenger]. 43When He had said this, He shouted with a loud voice, Lazarus, come out! 44And out walked the man who had been dead, his hands and feet wrapped in burial cloths (linen strips), and with a [burial] napkin bound around his face. Jesus said to them, Free him of the burial wrappings and let him go." In this case, Lazarus reached the end of his natural life twice. The Bible doesn't say, but angels would be ready at God's request to take this Lazarus to himself just as in the case of the Lazarus spoken about above in Luke. But Jesus was there to personally intervene. There was no conflict over the body or soul of Lazarus. Jesus himself took care of Lazarus personally by bringing him back to earthly life with the angels ready to step in to carry Lazarus to heaven if Jesus had not already intended to bring Lazarus back to earthly life. The final way to leave earth for the believer is at the end of time. You haven't gotten completely lost in the presence of God as Enoch, you haven't had a heavenly taxi ride as Elijah, you haven't gotten to the end of your natural life as Lazarus did in Luke 16 or Lazarus in John 11, and you are trusting Jesus Christ moment by moment, then the way left open to you is to be part of Jesus' Second Coming! Paul the apostle describes this in I Thessalonians 4:13-18 AMP, 13"Now also we would not have you ignorant, brethren, about those who fall asleep [in death], that you may not grieve [for them] as the rest do who have no hope [beyond the grave]. 14For since we believe that Jesus died and rose again, even so God will also bring with Him through Jesus those who have fallen asleep [in death]. 15For this we declare to you by the Lord's [own] word, that we who are alive and remain until the coming of the Lord shall in no way precede [into His presence] or have any advantage at all over those who have previously fallen asleep [in Him in death]. 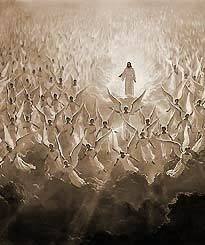 16For the Lord Himself will descend from heaven with a loud cry of summons, with the shout of an archangel, and with the blast of the trumpet of God. And those who have departed this life in Christ will rise first. 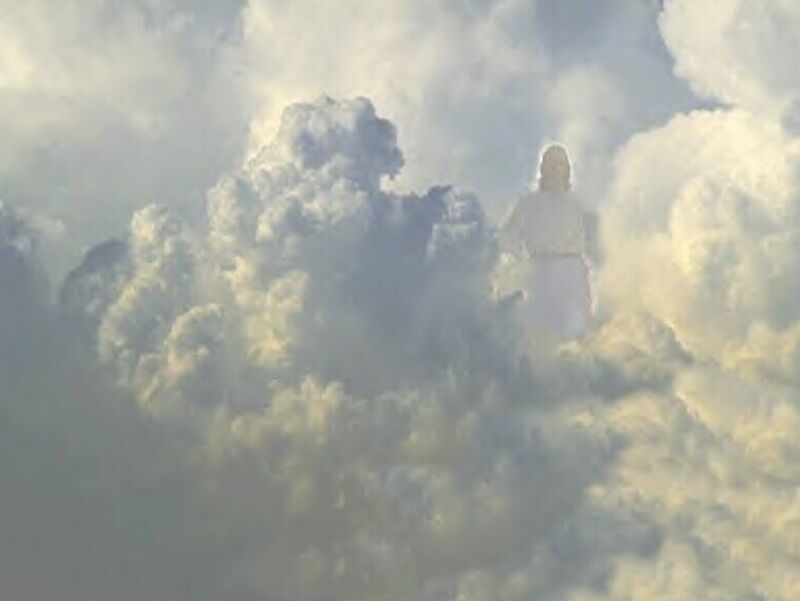 17Then we, the living ones who remain [on the earth], shall simultaneously be caught up along with [the resurrected dead] in the clouds to meet the Lord in the air; and so always (through the eternity of the eternities) we shall be with the Lord! 18Therefore comfort and encourage one another with these words." Do you see that this is a thing of comfort, of assurance? We are about to go to heaven where everything is clean and pure and healthy and free! The One who died for us, the One we have trusted, this One has sent the Holy Spirit to comfort us with the knowledge of the possible things that can happen to us, will them to happen to us individually as the Father wills! But every manner of exit from earth taken by those who love Jesus leads to being with God forever (after experiencing His presence in all circumstances now on earth)! I Corinthians 15:55 AMP "O death, where is your victory? O death, where is your sting?" If you have read this and conclude you don't know for sure if you know Jesus or you realize you believed in general about Jesus, but not personally for you, or you know for sure you don't know Jesus, all this can be changed by you now. It is not hidden on this web site how to ask Jesus into your life and on what conditions he will come in (recognize your need for his death for the things you know that God knows are wrong in your life). You can turn this situation and your life and your destiny around in just a moment. Careful thought and being persuaded is good, but the moment comes when you must decide. In Luke 17:20-37 AMP Jesus answers the question put to him about when the kingdom of God would come as if it were an earthly kingdom. Jesus responded not to look for an earthly throne 21"For behold, the kingdom of God is within you [in your hearts] and among you [surrounding you]." If you've understood the discussion to this point, the kingdom treasure (the Holy Spirit) really has taken up residence inside of you on the throne of your heart which is subtle compared to flags flying and other signs of earthly kingdoms. This will be the separation time of those who have believed in Jesus and those who have not, by ignorance or by choice: 34"I tell you, in that night there will be two men in one bed; one will be taken and the other will be left. 35There will be two women grinding together; one will be taken and the other will be left. 36Two men will be in the field; one will be taken and the other will be left." From this the fictional stories of disarray when Jesus comes for His children some have heard. Suppose the one taken was the driver of a car in motion? Will the car benignly stop or will it follow the laws of physics and continue its momentum minus the friction of the tires on the pavement and minus the resistance of the air against the windshield until it hits something or stops? I can't answer that but I think an answer is stirring in you. There are books and movies that have all kinds of things going on. The authors have thought about what it will be like for one to be taken and another to be left and are putting their thoughts out there for you to think about them. The thoughts are not video tapes of the future, but I'm sure they are published to make you think, make you consider, what path you are walking and what path you will have wished you had walked once Jesus has come and we who have trusted Him are gone. Some people have described it as having been left behind. It gives the thought of being "Home Alone" a whole new meaning. When will Jesus come again? Here is the origin of the expression, "Only God knows." Matthew 24:36-51 AMP tells us what our attitude should be, 36But of that [exact] day and hour no one knows, not even the angels of heaven, nor the Son, but only the Father. 37As were the days of Noah, so will be the coming of the Son of Man. 38For just as in those days before the flood they were eating and drinking, [men] marrying and [women] being given in marriage, until the [very] day when Noah went into the ark, 39And they did not know or understand until the flood came and swept them all away--so will be the coming of the Son of Man. 40At that time two men will be in the field; one will be taken and one will be left. 41Two women will be grinding at the hand mill; one will be taken and one will be left. 42Watch therefore [give strict attention, be cautious and active], for you do not know in what kind of a day [whether a near or remote one] your Lord is coming. 43But understand this: had the householder known in what [part of the night, whether in a night or a morning] watch the thief was coming, he would have watched and would not have allowed his house to be undermined and broken into. 44You also must be ready therefore, for the Son of Man is coming at an hour when you do not expect Him. 45Who then is the faithful, thoughtful, and wise servant, whom his master has put in charge of his household to give to the others the food and supplies at the proper time? 46Blessed (happy, fortunate, and to be envied) is that servant whom, when his master comes, he will find so doing. 47I solemnly declare to you, he will set him over all his possessions. 48But if that servant is wicked and says to himself, My master is delayed and is going to be gone a long time, 49And begins to beat his fellow servants and to eat and drink with the drunken, 50The master of that servant will come on a day when he does not expect him and at an hour of which he is not aware, 51And will punish him [cut him up by scourging] and put him with the pretenders (hypocrites); there will be weeping and grinding of teeth." The point is, people will be getting engaged, people will be getting married, getting their doctorates, getting their retirement accounts set up, putting their newspaper subscriptions on vacation hold while they go visit relatives and Jesus will suddenly come and take one but not the other. The news has been preached for over 2,000 years far and wide but perhaps you have not heard in a way you could understand. Pause; get your eternal destination settled with God by accepting His forgiveness and His Son (Psalms 2:12 AMP). Eternity is too long to spend it without God! Matthew 24:14 AMP states "And this good news of the kingdom (the Gospel) will be preached throughout the whole world as a testimony to all the nations, and then will come the end." I have listed on The Author Speaks page statistics from 2002 about the progress of the Gospel of Jesus Christ through out the earth. If you are thinking you can put off this decision and make it closer to the end, I strongly advise you not to for several reasons. First, you do not know the mind of God and you do not know the exact paths the Gospel has taken into the darkest corners of this planet. You may think you know but you do not know. The very place you think the Gospel has not reached, hidden from your eyes, may have people so glad they finally heard and are turning to Jesus even now as I type. Second, you have a conscience. Your conscience is supposed to inform you when you are wrong before any terrible consequences befall you. The ugly thought that you will keep up the life you now lead without God is having a destructive effect on your conscience. It should not seem right to you to avoid the God who made you and who has all power over you but soon your conscience will stop objecting. I Timothy 4:1-2 AMP says "1 But the [Holy] Spirit distinctly and expressly declares that in latter times some will turn away from the faith, giving attention to deluding and seducing spirits and doctrines that demons teach, 2Through the hypocrisy and pretensions of liars whose consciences are seared (cauterized)..." You won't know that you should care about what the consequences are because you have grown comfortable with the idea that the consequences aren't that bad. Third, II Peter 3:10-13 AMP saysJesus will come like a thief. One side of the planet will be day, the other side night. He will come when you are not ready because you cannot be ready suddenly. You can only be ready by having been ready. It's going to get too big for you. Things are going to get out of hand. You won't like it. I Thessalonians 5:1-11 AMP says Jesus will come like a "thief in the night." Fourth, you don't recognize that as lovely as Jesus is today during the time of mercy, you fail to realize it is possible to be on the wrong side of Jesus, the Lord of heaven and earth. Consider this tale of those who thought they had more time and didn't bother to get ready for the biggest event of their lives! Matthew 25:1-13 AMP. Fifth, you will be separated from loved ones. I had this dream in 1985. I dreamed there was a super highway and I was walking on one of the lanes and so was my father. I continued walking straight ahead while he had to walk off at an exit. I told him the dream and he understood it perfectly. Today, we are aware of Michael Landon's TV Show "Highway to Heaven." That's a perfect name for what I saw. Your loved ones want you to be with them forever. No jokes now. Sixth, it will be horrible to be around here anyway. Whatever you think you will gain by being away from God will be taken away. Revelation 6:16 AMP says there will be no place to hide. "16And they called to the mountains and the rocks, Fall on (before) us and hide us from the face of Him Who sits on the throne and from the deep-seated indignation and wrath of the Lamb." Honestly, just type some things you've heard into the Google search bar. Make sure you check out the scripture verses, not just someone's thoughts. Matthew 24 AMP. Seventh, you will have to deal with the Antichrist. Daniel 7:23 AMP "23Thus [the angel] said, The fourth beast shall be a fourth kingdom on earth, which shall be different from all other kingdoms and shall devour the whole earth, tread it down, and break it in pieces and crush it." My Lord, how beautiful you are! Oh Jesus, how beautiful You are! I don't know if we will have wings, but it's better to be with Jesus than any other possibility!